Little kids know about rules. If you explain the reasons behind the rules, they'll understand that, too. Charles Quigley, executive director of the Center for Civic Education, says children grasp these concepts as early as kindergarten. That's also a good time to introduce the idea of authority, and that people in authority should follow their own rules. He warns against waiting until high school. 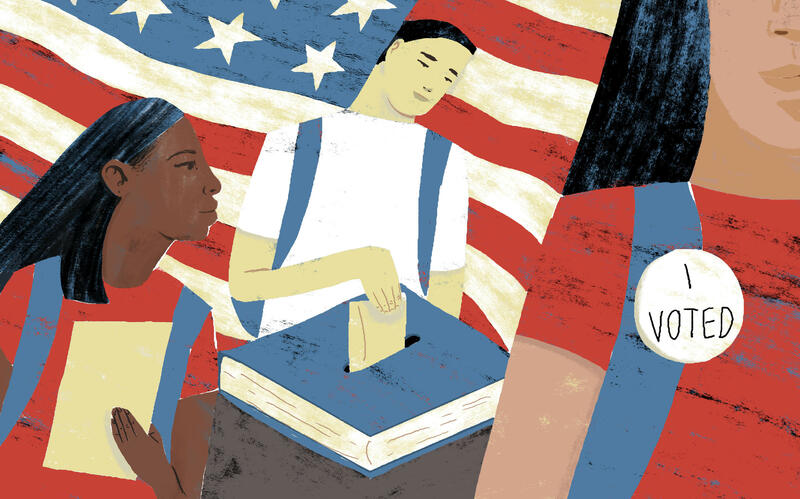 "The knee-jerk reaction to teach civics in high school is too little, too late," he says. "What's the dropout rate in some places? Forty percent? Some never get to that high school class." And according to Jim Shon of the Hawaii Educational Policy Center, civics education needs to extend into college. When kids grow up together in school, they build a community and are invested in it. He says after graduation, that community often disappears. "It is kind of hard to make students grasp the idea that, 'Oh, there's still greater community beyond what you had in school.' That's the baseline of a civic education. This is our community of our country." This year, both Florida and Missouri approved a civics requirement for public college students. No one is born with an inherent knowledge of how the U.S. government works, and everyone has some interaction with government every day. But some students learn more about their government than others. On the civics portion of the National Assessment of Educational Progress, commonly called the "Nation's Report Card," students of color and low-income students have consistently scored lower than their white, wealthier counterparts. "If there are students who are not receiving adequate instruction in civics education, and if those students are among the disadvantaged groups, then that's going to perpetuate some of the barriers to political participation and representation that we've seen in the past," says Elizabeth Levesque, an education research fellow at the Brookings Institution. That distance between marginalized communities and government has a disenfranchising effect. "What's happening is the affluent communities — political elites — are getting a good civics education," Charles Quigley says. "This is contributing to the empowerment gap." The principles of the U.S. government are enshrined in founding documents, but civics classes don't have to be a narrow, boring reading of those texts. "You'd never have a biology class without having a lab," says Louise Dubé, executive director of iCivics. "Kids must know, they must learn, they must evaluate, they must have the skills — but they must also do." Dubé's organization, founded by retired Supreme Court Justice Sandra Day O'Connor, creates free games and lessons for civics teachers. The games teach students about their personal rights, how local government works and how to anchor their opinions in facts. iCivics is also part of a group supporting a Massachusetts bill that would incorporate hands-on civics projects into the state's curriculum. At one Florida middle school, students learned about laws by writing bills — and in 2003, one of those bills made it to the Florida legislature. A class at Hialeah Middle School came up with the proposal, which would prohibit having and selling drugs within 1,000 feet of public spaces frequented by children. When it passed into law, then-Florida Gov. Jeb Bush held the signing ceremony at their school outside Miami. Michelle Montesino, now 29, was part of that class and still remembers that day. "It definitely showed me that if you believe in something and you feel something is important, to not be afraid to voice it," she says. But you don't need to draft legislation to learn about civics. When social studies teacher Todd Heuston stands in front of his students on the first day of class in Anchorage, Alaska, he knows some of them just aren't interested. "A lot of students are trying to find ways to take my U.S. government class online," he says. "They don't see any value in it other than it's simply just another hurdle or hoop to go through before graduation." It's hard to get his students to connect with what's happening in Washington, so Heuston focuses on local issues like curfew laws and marijuana policy. Then, when national issues come up, his students know how to ground their opinions in facts. "They don't always apply calculus every single day. They don't always apply history every day. But citizenship, civic engagement and involving themselves in the government is something they do every single day." "Civic participation in 2018 is different from civic participation in 1950," says Jon Valant, an education research fellow at the Brookings Institution. Today, Valant says, it's harder to instill empathy for people with different opinions because technology makes it easier to ignore those perspectives. You can unfriend someone on Facebook or mute specific phrases on Twitter. But living in a bubble means you have less opportunity or need to empathize with others. Plus, students are inundated with information from social media, and they need to learn how to wade through it all to find the facts. Amy Raper encourages students to do just that. She's an eighth grade social studies teacher in Pheonix, and says, "These kids think, 'Oh, Kanye West says this so it must be true.' I'm like, 'Guys, you have to look at everything. Facebook and social media cannot be your only way of finding knowledge.' "
Instead of dismissing the information her students see online, Raper asks them to verify it. One piece of advice she hopes sticks? "Question everything."